Autograph Letter Signed, “D. 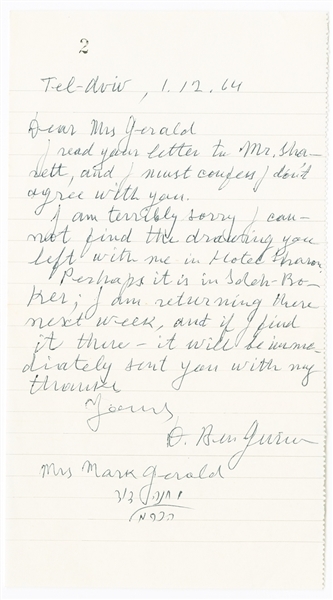 Ben Gurion” to Belle Gerald, December 1, 1964, Tel-Aviv. 1 p., 5 x 8½ in. on his lined pad, perforated at the right. Full transaction, “ Tel-Aviv, 1.12.64, Dear Mrs. Gerald, I read your letter to Mr. Sharett, and I must confess I don’t agree with you. I am terribly sorry I cannot find the drawing you left with me in Hotel Sharon.Perhaps it is in Sdeh Boker; I am returning there next week, and if I find it there, it will be immediately sent you with my thanks. Yours, D. Ben-Gurion, Mrs. Mark Gerald. Auction closed on Saturday, October 20, 2018.